The Heart Institute is expanding. 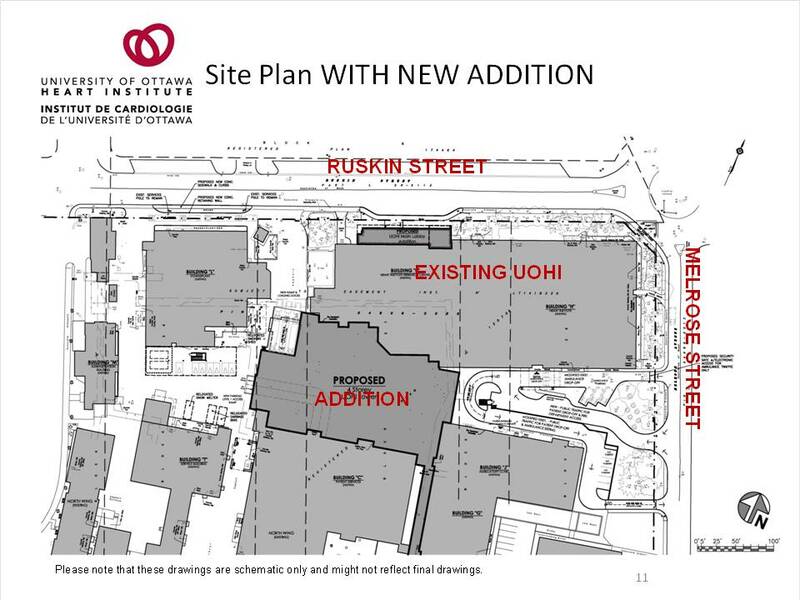 On January 13, Ottawa-Centre MPP Yasir Naqvi and the UOHI's Marion Fraser hosted a public open house to take questions and concerns related to the project. I was in attendance with City planner Doug James, along with construction contractors PCL. In addition, Ottawa-Centre MP Paul Dewar sent a representative to stay abreast of the project. Approximately 50 people were in attendance. My staff member Katie Bonnar took notes, and compared those with others', to develop the following re-cap of the Q&As. If you have questions, please don't hesitate to get in touch with my office. This is a five-year project managed by Infrastructure Ontario and tied to a provincial government timeline to ensure it is delivered on time and on budget. The construction will see the addition of 146,000 sq ft (over four floors and a penthouse) and an overhaul of 60,000 sq ft of the current building. PCL has been contracted for the project. The UOHI has set up a dedicated construction website (http://ottawaheart.ca/about_us/our-expansion.htm) that will launch on the 15th at the time of ground-breaking that will provide real-time updates as well as detailed information about the project and relevant contact information for those involved. This will also be a channel of communication for comments, questions, concerns and compliments – an email address, expansion@ottawaheart.ca, is already in use for this purpose. Q: Traffic issues on Melrose Avenue are a concern. Will the new winter "no stopping" restriction on the east side be extended to be in place year round? During construction, could no-stopping rules be added some of the west side as well? Is there a possibility of making Melrose a one-way street, going south toward Carling, to mitigate some of the traffic issues? A: Councillor Leiper will look into the matter to determine the feasibility of these ideas for Melrose . Q: Were other options explored for the temporary ambulance entrance on Melrose? What changes will be made to the door for its temporary use? A: Yes, all of the access points were considered, however they were eliminated due to a variety of factors, primarily patient safety and the need for a fast transfer of patients in crises into care as part of the STEMI procedure now in place. The Melrose door will be modified slightly to allow a stretcher to be able to pass and the UOHI is working with the city to determine what, if any, temporary structures can be put in place to ensure patient comfort (i.e. a temporary overhang to avoid patients being exposed to the elements during transfer from ambulance to hospital). The entrance will not have long-term modifications, such as concrete structures, built. 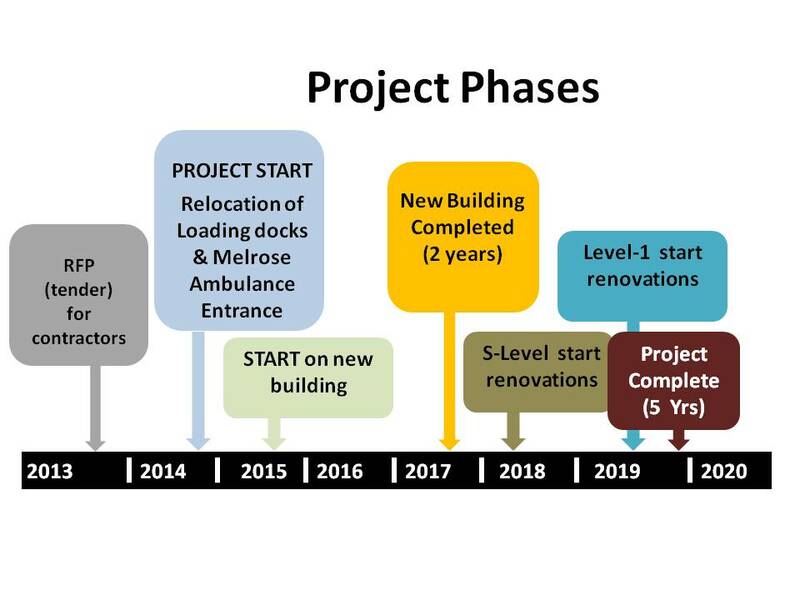 Q: If the loading docks are being moved, how will they be accessed by delivery vehicles? A: Delivery vehicles will enter the site from Ruskin, along the interior service road. The service road allows for one vehicle at a time as the limited width does not allow for passing. Therefore a traffic light is being installed on the interior service road and a flag person will be entrusted to ensure a coordinated flow of deliveries. Deliveries are also being spaced out to decrease queuing along the street. The need for a city-approved temporary lay-by on Ruskin to allow for queued vehicles was identified by residents and Councillor Leiper will look into the matter with staff to determine the feasibility of removing some parking spaces on Ruskin (between Parkdale and MacFarlane) for this temporary lay-by. Q: How can the delivery trucks and construction vehicles be discouraged from using residential roads to access the site? Q: Can PCL instruct construction vehicles to use the Queensway exit at Carling/Kirkwood to access the site instead of Parkdale? Q: Is there a traffic plan for the site that the public can consult? A: The traffic plan (unrelated to the site traffic plan that PCL is developing) was submitted with the site plan documents – Councillor Leiper will ensure that this document is available for the public. It should be noted that this plan outlines the current traffic as well as projected traffic, not traffic during construction. Q: Can the Parkdale/Ruskin light be rephrased to allow for a smoother traffic flow? A: Phasing is done in two ways: a programmed phasing and then an override controlled from a main location and adjusted in real-time, with an overall view of the entire traffic system, to assist with traffic flow. The programmed phasing of lights surrounding the site has been taken into account by the city and was incorporated into the site plan. Once construction begins, if it is determined that the phasing requires modification, it can be reviewed. Q: What about the vibrations caused by construction? Will neighbours be affected? A: UOHI has been proactive in the assessment of vibration impacts. Usually vibration consultations are carried out for buildings within 65m of a site, however OUHI has expanded this area to all those within 100m of the site (9 total affected houses). Consultants have been retained to carry out inspections and provide the documentation required. It should be noted, however, that OUHI will continue to treat patients throughout the duration of the project and those patients cannot be adversely affected by the vibrations. Patients will be monitored appropriately to ensure there are no disruptive vibrations and they are much closer to the site than residents, so impact is expected to be minimal. Q: What hours will PCL keep for the construction? A: PCL anticipates keeping normal working hours, Monday through Friday. There will moments during the construction, such as when the concrete slabs are poured, where construction will go beyond normal hours. For those rare instances, residents will be made aware. Councillor Leiper is working with UOHI and PCL to ensure that the impacts of noise are mitigated, in consultation with the community. Q: Will the site entrance be on Ruskin throughout the project? A: Ruskin will the primary entrance for the construction. Melrose will be used briefly, and concurrently with Ruskin, but Ruskin remains the primary entrance to the site. Q: Is there a process for addressing resident problems or issues once construction has begun? A: UOHI is developing a Frequently Asked Questions section for the construction website as well as collecting all of the relevant contact information into one place so that residents can easily and quickly find who they need. The expansion@ottawaheart.ca email address is always available for this purpose and UOHI requests that if residents write in to that email address, that they also let UOHI know if they give permission for their question to appear on the expansion website – chances are more people would be keen to know the answer and this way UOHI can build a comprehensive resource on the project. Periodic public information sessions will be held to provide comprehensive project updates. Q: What sort of light spill-over can residents directly abutting the UOHI expect to see once construction is complete and the site is operational? A: There is an at-grade tunnel linking The Ottawa Hospital and UOHI, which is set back quite a distance from Melrose, at the interior of the site, but will be lit. The tunnel is used for patient transfers and, as such, cannot be on motion detectors. UOHI will look into options to mitigate the amount of light disturbance generated by this tunnel. There will be no offices on the sides adjacent to the neighbourhood, so no anticipated light spill-over and no patient rooms until the top two levels of the newly constructed expansion. As they are patient rooms, it is expected that unless there is an unfortunate incident in one of the rooms during the night, the rooms will primarily be dark throughout the nights while patients sleep. Just as with the previous expansion, with regards to light spill-over, curtains and other light-mitigating designs will be explored and implemented as required. Q: What is the plan for public parking on the newly constructed site at 2020? A: Many of the hospital staff have already been decanted to the aforementioned satellite parking locations, but UOHI is also looking at policy changes that may improve parking. These policy changes include adjusting and shifting both working hours and visiting hours to better accommodate flow and better serve UOHI users. Q: What is the anticipated lifespan of the site? A: UOHI anticipates that the site will be in operation for 15 to 20 years when it will join The Ottawa Hospital on the new Agriculture Canada site during the final phase of its expansion. Q: Is there a plan that the public can view that indicates what greenery and trees will be incorporated into the new site? A: Yes – a plan exists that outlines the expected landscaping and replanting that will take place as a part of the expansion. Please see the below pdf of the plan for further details.